Raheem Sterling has been in impressive form for England and Man City. 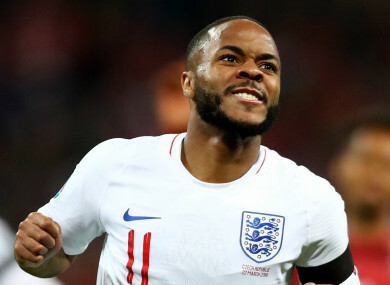 HARRY MAGUIRE HAS claimed Raheem Sterling is the best player in the Premier League this season and wants England fans to “cherish” the in-form Manchester City winger. “I think he’s been the best player in the Premier League,” Maguire. “He’s scoring goals, creating goals and he’s a nightmare to play against. He’s taken his game from last year, where people saw the rise of Raheem, to this season where he has gone on to another level. At the next tournament we’ll want to go further,” Maguire said. “I think we are the only semi-finalists of the World Cup teams to get through to the Nations League finals, so that shows the progress we are making. “There were comments after the World Cup that we didn’t beat any of the top, world-class teams, so it was nice to be put in a group with teams like Croatia and Spain — arguably the most difficult one of all — and come out on top. Email “'He's been the best player in the Premier League'”. Feedback on “'He's been the best player in the Premier League'”.